A few weeks back we mentioned that we will begin a new series on communication with words. We asked you, our readers, for some ideas of what you would like to know more about regarding this subject and got some great responses. We'd like to start this series with a quiz about infant communication. So, let's see how much you already know! What do you think is the most common 1st word said by babies in the United States? 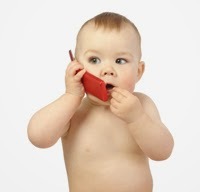 At what age do babies start babbling? On average, at what age do babies speak their 1st words? True or False. Early vocabulary development is stimulated when parents label specific objects for their babies. i.e "that is a block!" True or False. Focusing on motor development, like learning to crawl or walk, can temporarily take your baby’s focus away from learning to speak. At what age do babies start recognizing words for common items? At what age is your baby able to follow directions? Get your answers ready! We'll share the answers we found at the end of the week. Baby Behavior is on the road again! Blog Remodel - We need your advice!